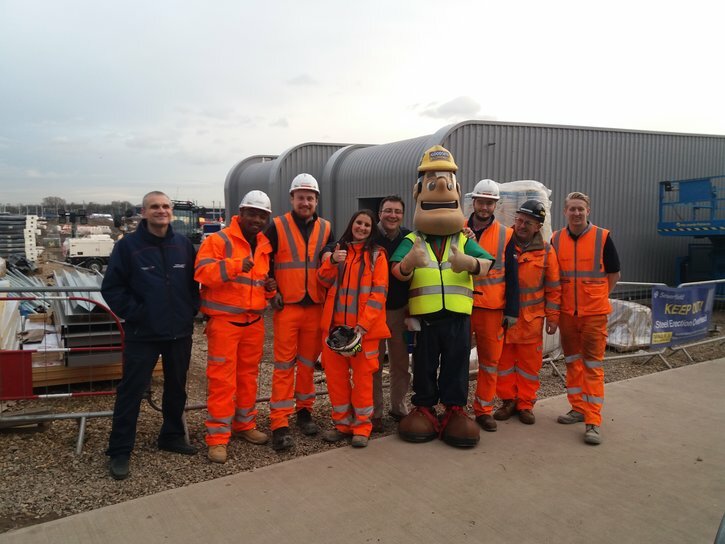 The Old Oak Common team recently took advantage of a rare opportunity to declassify parts of the site now that the Operations, Maintenance and Control (OMC) building is substantially complete, and invited their friends and family to visit before the next stage of works in preparing the home for the new Elizabeth line fleet of trains. 108 visitors were welcomed to the site where they initially viewed time-lapse footage of construction so-far to appreciate the progress that has been made since work began in 2014, and after a safety briefing they took an accompanied walk around the site to appreciate its scale and learn about the team’s achievements to date. They were able to view the work of our Business Information Modelling (BIM) team and view a virtual reality model of the project, moving around the depot and sidings using an X-Box controller. Younger visitors also took part in a drawing competition, learnt about noise on site and why it’s so important to wear hearing protection, got to sit in some items of plant, and met the Considerate Constructors Scheme’s Ivor Goodsite.